I know I got you right there with the title of this post, and I am sure you must be wondering, how anyone in their right senses could wear a jacket in summer, but fashion says you can. Summer can be so hot, and extremely uncomfortable sometimes, but nevertheless, you can still fit in your cute and stylish jacket, by following these tips. Get a perforated jacket to encourage air flow. Just like mine, zip down and go wild. Try a lighter color, no to black jacket in summer. The bomber is well bombed, with a classic luster fabric and features a silhoutte with a silver zip closure, ribbed cuffs and collar. Has front pockets and feels really comfortable. 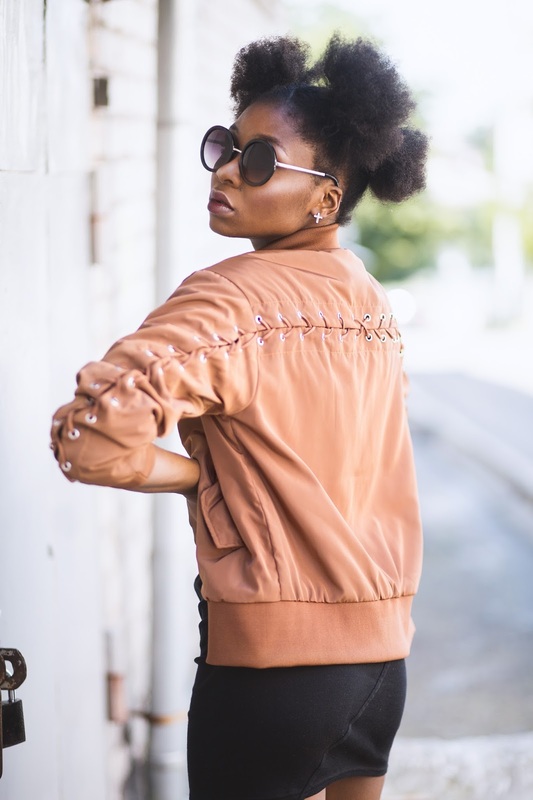 To get this statement brown lacing bomber jacket, visit na-kd fashions, this jacket is available in different colors such as blue, white, red and green. Get it for less by using the discount code melodyjacobs20 at checkout, you also get free shipping. Wishing you a happy summer holiday.